The Ryan Brougham was a small single-engine airliner produced in the United States in the late 1920s and early 1930s. Its design was reminiscent of the M-1 mailplane first produced by Ryan in 1926, and like it, was a high-wing, strut-braced monoplane of conventional design. Unlike the M-1, however, the Brougham had a fully-enclosed cabin for the pilot and four passengers. The Brougham prototype was derived from the later M-2 and was powered by a 150 hp Hisso  engine. Originally priced at $12,200, the price was reduced to $9,700 when fitted with a Wright J-5, and $5,750 with Hisso. One Brougham was fitted with floats. The only common parts between the famous Spirit of St. Louis and the first Ryan B-1s were the tail surfaces and a few of the wing fittings. Later B-1 Brougham production versions had no common parts. The first production B-1 Brougham was ordered by a local hotel owner, but was delivered instead to well-known pilot Frank Hawks and was named "The Gold Bug". Charles Lindbergh had come to the factory to examine that first B-1, but had instead ordered a completely new aircraft to his specifications. He used the Ryan NYP Spirit of St. Louis on his record-breaking transatlantic flight of 1927. Hawks renamed his B-1 "Spirit of San Diego" and flew to Washington with his wife to greet the triumphant Lindbergh. In the ensuing glare of publicity, Hawks was hired by the Ryan Aircraft company to be its official representative. With the public idolizing Lindbergh, Hawks toured the country, selling rides in the aircraft "like Lindy flew." His Spirit was actually painted gold, but looked the part to the public. Another reason for the success of the Brougham was its performance at the 1927 National Air Races in Spokane, Washington where Hawks, who had obtained a contract with Maxwell House Coffee, with the now renamed "Miss Maxwell House" came in first for speed in the Detroit news Air Transport Speed and Efficiency Trophy Race. Later, at the 1928 Ford Tudor Reliability Trial and Air Tour, Hawks placed sixth in "Miss Maxwell House". Hawks popularized the type, which stimulated demand among small airlines and charter operators. The Brougham not only sold well in the domestic market, but was exported to China, Guatemala, Mexico and Salvador. Production peaked at 20 per month but was eventually halted by worsening economic conditions in the United States that led to the sale of the Ryan factory in October 1930. Lindbergh's successful trans-Atlantic flight led to a slightly modified Ryan Brougham being ordered for the first attempted trans-tasman flight between Australia and New Zealand. Named 'Aotearoa', the Māori name for New Zealand, and crewed by New Zealanders John Moncrieff and George Hood the aircraft left Richmond, near Sydney on the 10th of January 1928, on a flight expected to take about 14 hours. Radio signals were heard from the 'Aotearoa' for 12 hours before abruptly ceasing. The aviators failed to arrive in New Zealand, and no trace of them or their aircraft has ever been found. 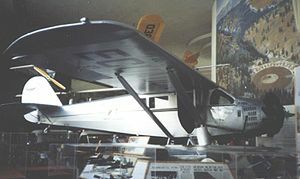 As of 2001, only two complete Broughams were preserved, one at the San Diego Air & Space Museum, and the other at the Cradle of Aviation Museum, where it has been modified to represent the Spirit of St. Louis. Over the next few years, restoration work continued on another three aircraft, one owned by the Yanks Air Museum and two by Scott Gifford of Prescott, Arizona. One of the latter two Broughams features modifications made in September 1927 to accommodate the transport of MGM mascot Leo the Lion on a transcontinental flight; many of its passenger cabin fittings were removed to make room for Leo's cage . Although this aircraft subsequently crashed en route, neither the pilot nor Leo were injured. Data from: Munson 1982a, p. 129. "Aircraft Restoration." Yanks Air Museum. Retrieved: 3 March 2009. Daniels, C.M. "Speed: The Story of Frank Hawks." Air Classics, Vol. 6, No. 2, December 1969. Hearn, Gail. "A Brougham fit for a King." Air & Space, 1 March 2006. Retrieved: 3 March 2009. Munson, Kenneth. Airliners from 1919 to the Present Day. London: Peerage Books, 1982a. ISBN 0-90740-836-2. Munson, Kenneth. U.S. Commercial Aircraft. London: Jane's Publishing, 1982b. ISBN 0-86720-628-4. "Ryan NYP 'Spirit of St. Louis'." Cradle of Aviation Museum. Retrieved: 3 March 2009.